Members of the Department of Theoretical Physics and History of Science of the UPV/EHU's Faculty of Science and Technology together with researchers from the University of Hannover have achieved quantum entanglement between two spatially separated Bose-Einstein condensates, ultra-cold atomic ensembles. The team lead by Géza Tóth, Ikerbasque Research Professor, concentrated on verifying the presence of entanglement by measurements, while the experiment at Hannover was carried out in the group of Carsten Klempt. The study is published in Science. Quantum entanglement was discovered by Schrödinger and later studied by Einstein and other scientists in the 20th century. It is a quantum phenomenon with no counterparts in classical physics. The groups of entangled particles lose their individuality and behave as a single entity. Any change in one of the particles leads to an immediate response in the other, even if they are spatially separated. "Quantum entanglement is essential in applications such as quantum computing, since it enables certain tasks to be performed much faster than in classical computing," explained Toth. 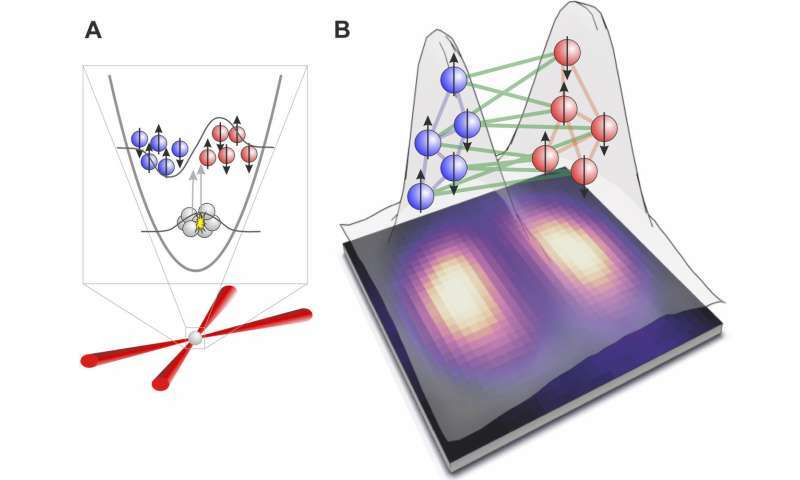 Unlike previous methods of quantum entanglement involving incoherent and thermal clouds of particles, in this experiment, the researchers used a cloud of atoms in the Bose-Einstein condensate state. Tóth said, "Bose-Einstein condensates are achieved by cooling down the atoms to very low temperatures, close to absolute zero. At that temperature, all the atoms are in a highly coherent quantum state; in a sense, they all occupy the same position in space. In that state, quantum entanglement exists between the atoms of the ensemble." Subsequently, the ensemble was split into two atomic clouds. "We separated the two clouds from each other by a distance, and we were able to demonstrate that the two parts remained entangled with each other," he continued.